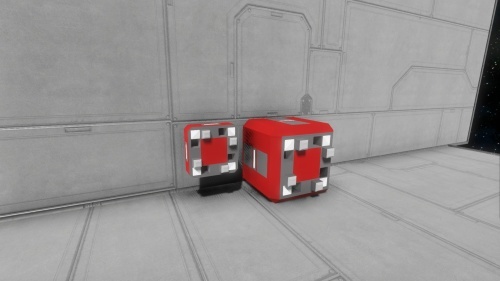 The merge block allows two ships, stations, or parts to connect, and disconnect from each other much the same as Connectors. However that is where similarities end, the merge blocks literally merge both ships together. In technical terms, separate grids (ships) merge together via two merge blocks to become one single grid. While in this state, the two act as one. Power is shared, and control panel interface is merged, and thruster control is also shared. Powering off one side of the merge block connection will disconnect both grids, allows them to part ways. The merge block will attract and connect to another merge block when brought into proximity, combining two grids. This process is entirely automatic by both merge blocks once both merge faces are oriented into a compatible locking position. When merged, power and control will be shared across both grids. Much like the Connector, these functions rely on a power supply native to both grids in order to power the merge blocks. Merge blocks do not directly provide cargo transfer support. When both grids are merged, users may bridge them together with other blocks such as Conveyors or Connectors as they will count as a single ship grid. Small ships may only merge with other small ships, large ships may merge with other large ships or station grids. For a successful decoupling, the only blocks connecting two ships must be the merge blocks themselves, or blocks that cannot stick together without structural support. Simply powering down one of the merge blocks will allow the two ships to part. For large ships to decouple from stations, the large ship or station must first disable one of the merge blocks, and then the ship must be converted back into a ship before being able to go under way (this only applies if Station Voxel Support is disabled in the world). Merge Block is powered and ready to make a connection to another powered Merge Block. Merge Block is powered, and is within proximity of making a connection to another powered Merge Block. Merge Block is connected to another powered Merge Block. The connection established is also locked (engaged) and capable of bearing a physical load to retain the connection. Merge Block is unpowered (disengaged) and electrically disconnected from any other Merge Blocks within mating proximity. You can use Merge blocks for anything, it doesn't simply have to be about docking or keeping something from flying away, but this is a common use. Merge blocks are airtight and also when merged with other Merge blocks. This can be used to create a pressurized path between ship to ship, or ship to station. If a block other than the merge blocks merges with the other ship, that block must be removed in order to detach. To transfer cargo while merged together, use two Connectors. If both are powered, they will attract to each other (electromagnetically) and make a connection. The Connectors should be locked after they are connected. If the merge blocks are too close to the hull when they attach/detach, it can cause minor damage or deformation to the 4 surrounding blocks around them. This page was last modified on 26 October 2018, at 22:58.